If you've ever breastfed your baby, you know what I mean when I mention cluster feeding. This milk stash was with my youngest son. When I was starting my breastfeeding journey with our youngest son which lasted 14 months, the early weeks were so tiring. Why you may ask? Well, let me introduce you to something known as cluster feeding. I had no idea what people were referring to when they said he'd be cluster feeding the first 'few weeks' which by the way turned into five weeks. I found out let me tell you. 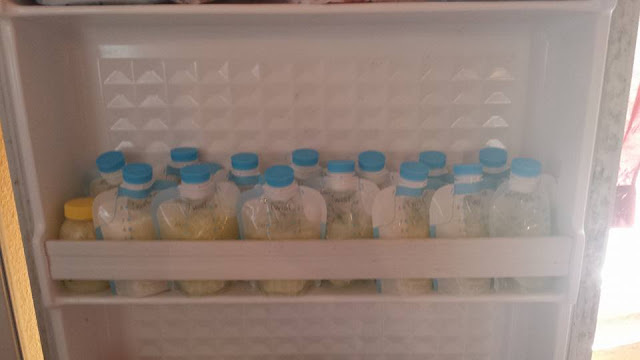 Cluster feeding is when baby seems to be constantly hungry and wanting to nurse 24 7 basically. Well, with our son he would nurse 10 minutes or so give or take, but every 30 - 45 minutes until about dark, then he'd go an hour - hour in a half in between feedings. During the night though, from 3 weeks until he slept all night (3 months old), he went four hours at night only, in between feedings. I'm not sure why babies cluster feed in the beginning, but I suppose it's to get them in routine of nursing and getting the milk. I'm not sure. - Hanging out in bed or on the couch between the time our older two got on the bus until about lunch time, then move positions until it was time to get them off the bus in the afternoon.